I knew who Ray Harryhausen was. 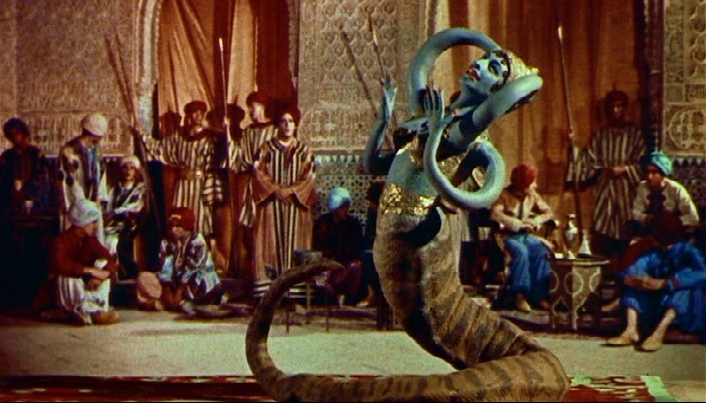 special effects, while Sinbad was his first feature in color. 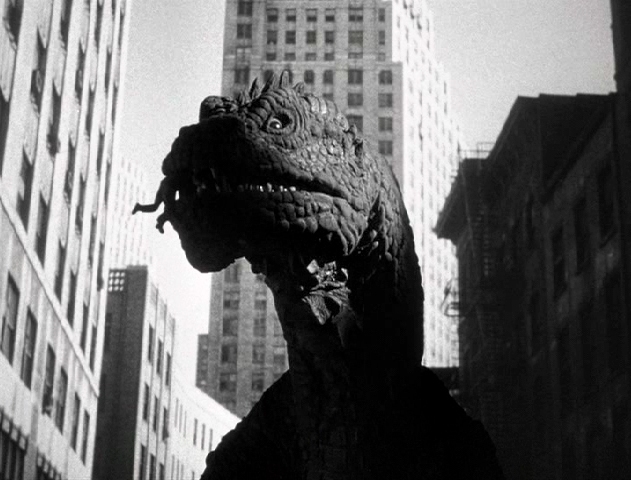 Consider this: what’s the classic 1950s monster movie formula (non-extraterrestrial division)? Isn’t it the creature unleashed by humanity’s meddling with nature, usually in the form of unrestricted nuclear weapons testing? Men go settting off enormous bombs and before you can say Run for your lives! some gigantic this-or-that is stomping around putting us puny little creatures in our place, right? Well, The Beast from 20,000 Fathoms is the original, the “onlie begetter”. I’d call it the granddaddy of them all — except that its offspring began proliferating when it was barely a year old, too young to be a grandfather. When I revisited the picture in prep for this post (the first time I’d seen it in at least 40 years), I was a little apprehensive about what I might find; it wouldn’t be the first childhood favorite to decompose before my startled eyes, like a clumsy piece of taxidermy. I needn’t have worried; Beast is as fresh and vigorous today as it was when I first saw it — back when I would hardly have thought to use words like “fresh and vigorous” (I probably said something more along the lines of “keen” and “neat-o”). It’s a lesson we can’t relearn too often: the cliches don’t pull you down when you invented them in the first place. 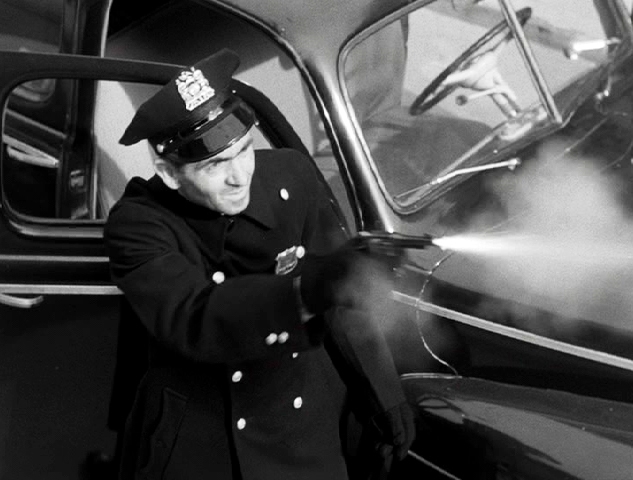 Beast was independently produced by B-movie specialist Jack Dietz, who had made his name cranking out East Side Kids programmers with Leo Gorcey and Huntz Hall on Poverty Row in the ’40s. Ray Harryhausen says the negative cost was $200,000 — neither lavish nor shoestring in those days, just a decent, respectable B budget. (“Today,” Harryhausen says, “you can hardly buy a costume for $200,000.”) Dietz stretched his budget by hiring Eugene Lourie to direct. The IMDb says Lourie also served as production designer, though on screen he’s credited only as director. If Lourie did do double duty, it would make sense; the bulk of his career was as an art director, first in France, then in Hollywood (his last credit was Clint Eastwood’s Broncho Billy). This would also explain how Dietz, between Lourie’s design sense and the deft use of stock footage, managed to get an A-picture look on a B-picture budget. The picture begins literally with a bang: an atomic test north of the Arctic Circle that frees the creature from suspended animation in the polar ice (audiences never tire of these stock shots of atomic explosions; they’re as fascinating now as they were half a century ago). The first man to see the beast is one of the attending scientists (Ross Elliott, in the designated role of First Expendable Victim). The second witness is the other scientist, our hero Tom Nesbitt (Swiss actor Paul Hubschmid, under the anglicized name of Paul Christian), and the movie’s first act follows Nesbitt’s crusade to prove to the skeptics around him — his military pal Col. Jack Evans (The Thing from Another World‘s Kenneth Tobey), paleontologist Dr. Thurgood Elson (Cecil Kellaway) and Elson’s assistant Lee Hunter (Paula Raymond) — that he saw what he saw. 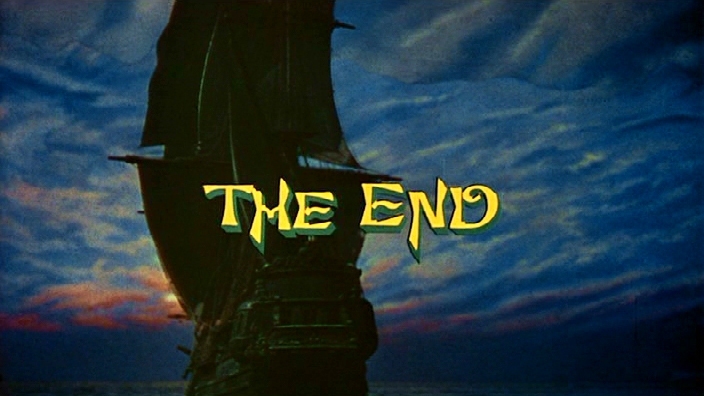 Meanwhile there are a number of unexplained occurences, including the sinking of a fishing boat whose sole survivor is dismissed as a deranged crackpot when he claims it was the work of a “sea serpent” (the sailor is played by John Ford regular Jack Pennick, his grotesque teeth either straightened or, more likely, replace by dentures). 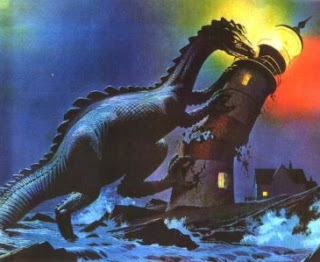 Another of these occurences is the destruction of a lighthouse on the coast of Maine, an episode straight from the Ray Bradbury short story that (according to the credits) “suggested” Lou Morheim and Fred Freiberger’s screenplay. And this is as good a place as any to discuss the movie’s origins. …but, with modifications, the look of the monster itself, as you can see by comparing the frame from the movie above with this illustration from the magazine. In the movie the beast is identified as a “rhedosaurus”, a species that does not exist in the annals of paleontology. It’s fun to believe that the first two letters of the beast’s name stand for the “RH” of Ray Harryhausen (Harryhausen denies it, but I think perhaps he doth protest too much). 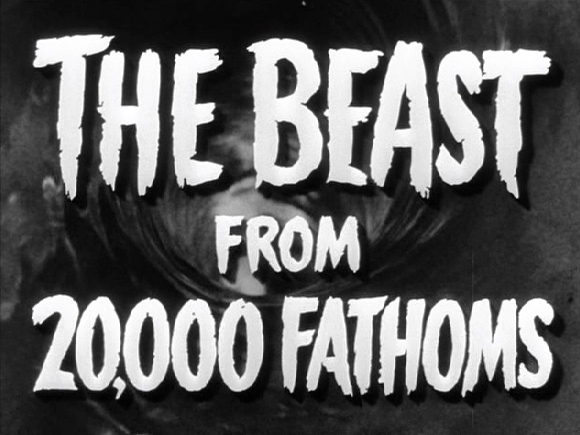 And doesn’t the title The Beast from 20,000 Fathoms have a great ring to it? Much better than Monster from the Deep. Scientifically, it’s nonsense; a fathom is a measure of nautical depth, six feet — or, at the rate of 20,000, 22.7 miles. The beast from 22.7 miles down, in an ocean (the Arctic) that never gets deeper than 3.4 miles? Even the deepest spot on earth, the Mariana Trench in the Pacific, is only 6.9 miles. But never mind, The Beast from 20,000 Fathoms sounds awe-inspiring, primeval, almost Shakespearean; kudos to that Saturday Evening Post editor for coming up with it. 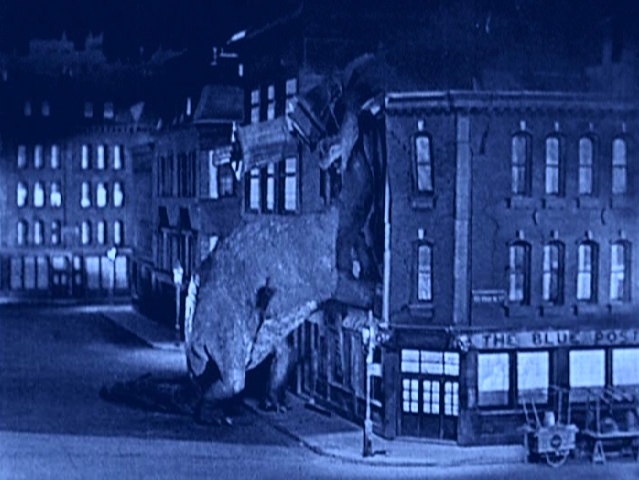 The Beast‘s money scene is the monster’s invasion of New York (not far, Kellaway’s Dr. Elson tells us, from where the only rhedosaurus fossils have ever been found), and the Big Apple hasn’t had it so bad since King Kong came to town. In fact, compared to the rhedosaurus, Kong’s rampage looks comparatively benign: a quick shot of newspaper headlines tells us there are 180 known dead, 1,500 injured, and damages estimated at $300,000,000 (and that’s in Eisenhower dollars; add a zero or two to get a current equivalent). 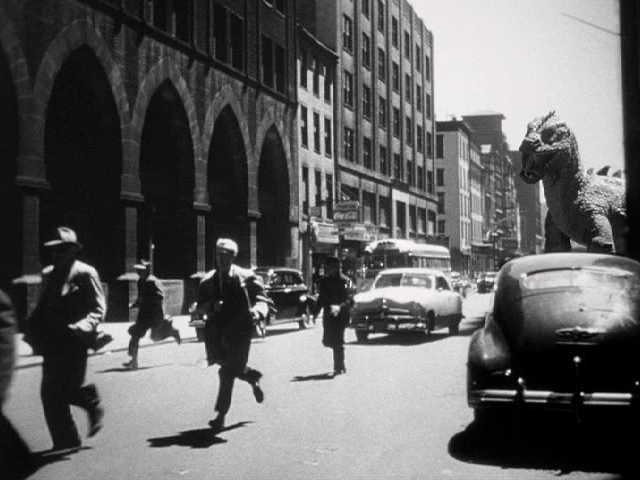 “The worst disaster in New York’s history!” shouts a radio newsman, as the National Guard is trucked into town, hospital emergency rooms are overwhelmed, and New Yorkers cower behind their doors, afraid even to look out the window. monster’s teeth and downed in one quick gulp. the cowering lawyer off the toilet in Jurassic Park. more poignant when viewed today. less explicit loss of life). 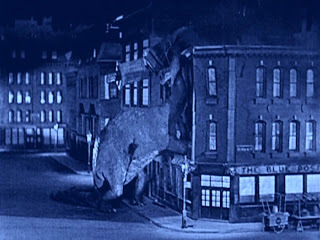 Ultimately, the rhedosaurus is cornered at Coney Island, wounded and enraged by a lucky shot earlier in the evening from a National Guard bazooka. Worse, the nuclear test that freed it from its icy tomb seems to have turned it into a carrier of some virulent radiation sickness; soldiers exposed to the manhole-size drops of blood falling from its wound have been keeling over without warning left and right. Tom Nesbitt announces that (for reasons the script doesn’t slow down to explain) the only way to stop the creature is to shoot a radioactive isotope into its wound “and destroy all that diseased tissue.” So Nesbitt and an Army marksman (an amazingly youthful Lee Van Cleef) don their haz-mat suits and ride to the top of the rollercoaster for a clear shot, and at last the monster’s number is up. Once The Beast from 20,000 Fathoms was in the can, Jack Dietz tucked it under his arm and went shopping for a distributor. 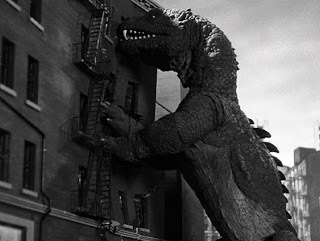 Eventually, he sold it to Warner Bros. for (according to Harryhausen) about $450,000. 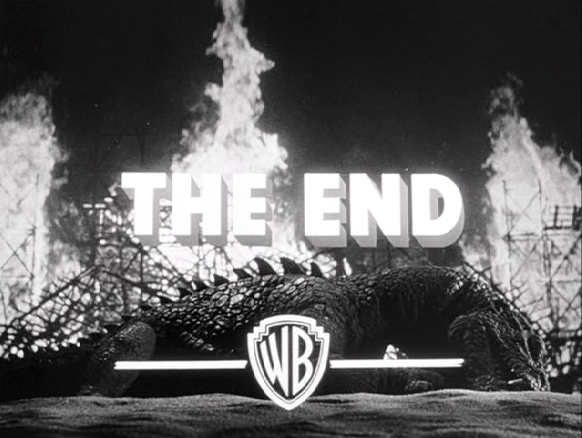 That represents a very tidy profit over his original investment, but with a fly in the ointment: Harryhausen says the picture went on to make “millions” for Warners — $5,000,000, as a matter of fact, at a time when that was real money; nearly twice as much, for example, as Bwana Devil, the surprise hit of ’53 that kicked off the first short-lived 3-D craze. More, too, than other 3-D hits of the year, like Charge at Feather River, It Came from Outer Space and Kiss Me, Kate (not quite as much as House of Wax, though, but pretty close, and without the novelty of 3-D). Warner Bros. profited from Beast in another way as well. Barely a year (in fact, 371 days) later, the studio released its own homemade variation: Them! Warners knew a good thing when they had it, and they stuck close to the formula. Once again, nuclear testing unleashed a horrible freak of nature (this time, giant mutant ants), a major city came under attack (Los Angeles), and a beloved old character actor was along to play the movie’s senior scientist (Edmund Gwenn, in a role very much like Cecil Kellaway’s in The Beast). Other animals, insects, arachnids, even humans, would stumble into the atomic oven and thunder out their warnings of Things Man Was Not Meant to Meddle In, and plenty of them are on view in this blogathon. 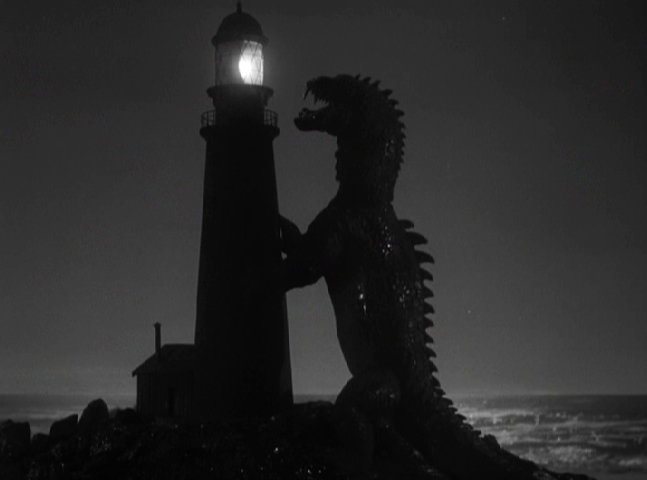 The Beast from 20,000 Fathoms led the way, and proved there was gold in them thar radioactive hills. After The Beast, Ray Harryhausen was on a roll: It Came from Beneath the Sea, 20 Million Miles to Earth, Earth vs. the Flying Saucers. 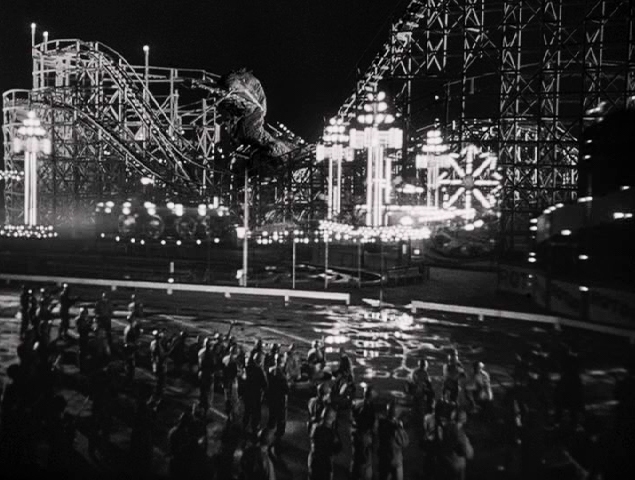 But in 1958 he, producer Charles Schneer and director Nathan Juran made a picture that represented an orders-of-magnitude leap forward on the keen-and-neat-o scale. Partly because it was in georgeous, eye-popping Technicolor. But there was also the sheer volume of its visual effects. The Beast from 20,000 Fathoms runs an economical 79 minutes, and its effects shots add up to (surprisingly) only 7 minutes 5 seconds — or 8.9 percent of the running time. 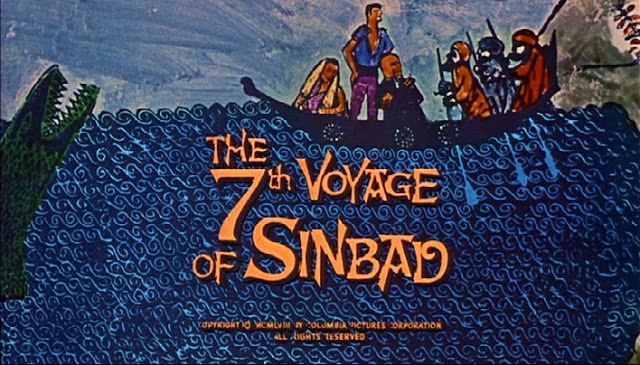 The 7th Voyage of Sinbad runs 88 minutes, with 17 minutes 27 seconds of effects — 19.8 percent. More monster-time, but more monsters, too; more, in fact, than all Harryhausen’s previous pictures put together. The Beast, It Came from Beneath the Sea and 20 Million Miles to Earth each had a single animated creature. But Sinbad had more than you could shake a scimitar at. uncharted island of (appropriately) Colossa. In Bagdad, Sokurah performs wonders for the Caliph and the visiting Sultan of Chandra, including (briefly) joining the Princess’s serving woman and a serpent into this amazing, sinuous creature before returning the servant (and presumably the snake) back to their original bodies. Sokurah attempts to wheedle the Caliph into fitting out an expedition to return him to Colossa, but the Caliph remains firm; his mind is not to be changed even by such clever tricks as these. Perhaps, Sokurah mutters ominously, an even greater demonstration of my powers is called for. The next morning, Sokurah has done his work. Princess Parisa is discovered in her bedchamber, alive and well but shrunken to the size of a tiny doll. The Sultan, outraged and grieving, vows to reduce Bagdad to ashes to avenge this insult to his daughter. His hand is stayed only when Sinbad seeks out Sokurah and gets the sorcerer to admit that he can return the Princess to her normal size — but only with a potion using the eggshell of the giant bird, the Roc, which is found (of course) only on Colossa. So the magician has at last extorted his expedition after all, to be led by Sinbad himself. 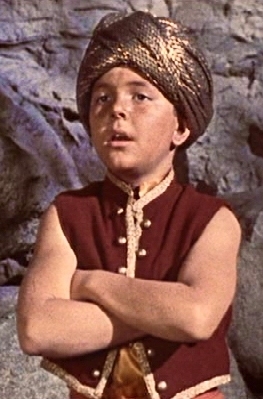 But Sinbad fears — knows — that Sokurah can’t be trusted, and that he will have to be kept a wary eye on. 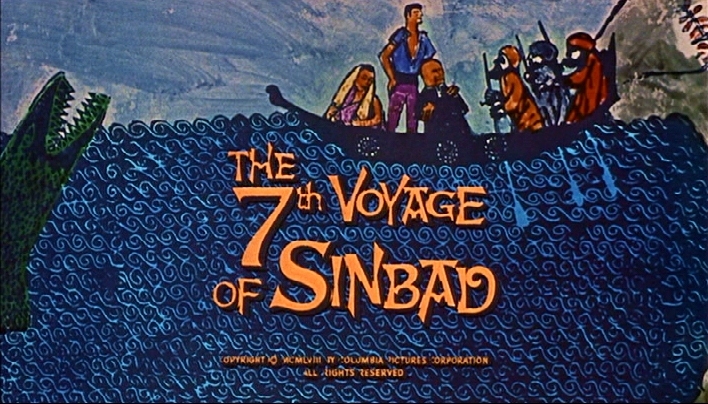 The 7th Voyage of Sinbad was part of a movie vogue that was petering out by the time it went into production in 1957: the Arabian Nights adventure. The genre — at least this incarnation of it — had begun in 1940 with the phenomenal success of the marvelous, magical The Thief of Bagdad from Alexander Korda’s London Films. It spurred a flood of similarly-themed adventures throughout the ’40s — most noticeably in a series of campy Technicolor romps from Universal starring Jon Hall and Maria Montez (“the King and Queen of Technicolor”), but cropping up in other unexpected places, like MGM’s Kismet (1944) with Ronald Colman and Marlene Dietrich, and Warner Bros.’ update of The Desert Song (1943), with Dennis Morgan as a burnoose-clad freedom fighter battling Nazis in war-torn Morocco. 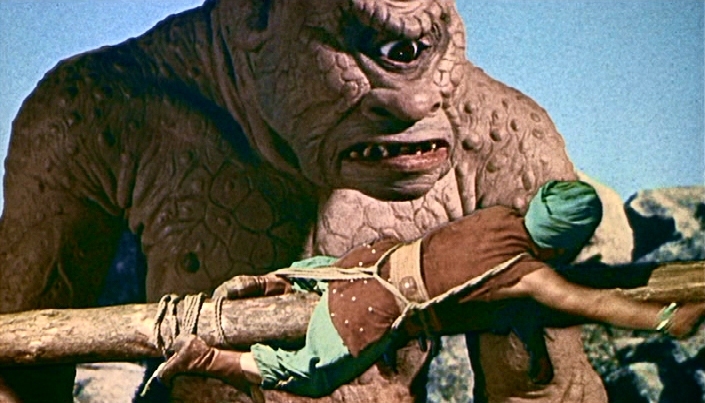 It was during this time that Ray Harryhausen first conceived the idea of a Sinbad adventure, and he drew a series of preliminary sketches of the kind of thing he had in mind. There had been Sinbad the Sailor in ’47, but that was a conventional swashbuckler with Douglas Fairbanks Jr. and Maureen O’Hara; Fairbanks spoke of battling Rocs and Cyclops and dragons, but what the movie showed was far more mundane. 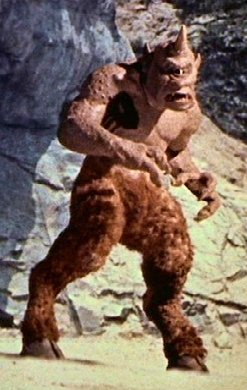 Harryhausen’s idea was to make a movie filled with the things Fairbanks’s Sinbad only talked about. Unfortunately for him, in 1955, RKO Radio Pictures mogul Howard Hughes, while he was in the process of running his studio into the ground, produced Son of Sinbad with Dale Robertson, which rightly laid a Roc-sized egg at the box office. Wherever Harryhausen turned, the answer was the same: “sailor pictures” are dead, just look at what happened to Son of Sinbad. But producer Charles H. Schneer — with whom Harryhausen had already made It Came from Beneath the Sea, Earth vs. the Flying Saucers and 20 Million Miles to Earth — believed. 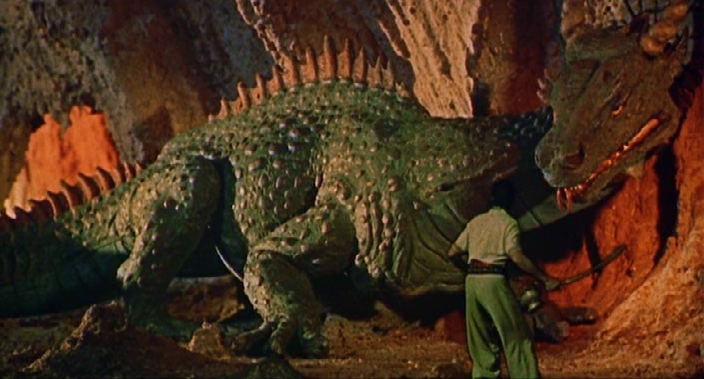 He even wanted to shoot in color, about which Harryhausen was dubious. 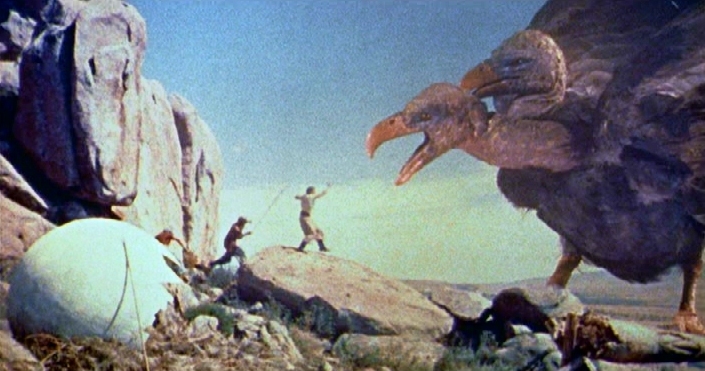 Harryhausen had just developed a process — later dubbed Dynamation — with which he could combine live action and special effects animation on the same strip of film negative without having to resort to costly and time-consuming matching of negatives in the lab (the animation alone was costly and time-consuming enough), and he wasn’t sure it would work for color as well as for black-and-white. But Schneer had him shoot some tests to make sure, and they were on their way. …or most awe-inspiring of all, the skeleton Sokurah brings to life and arms with sword and shield to duel Sinbad to the death. 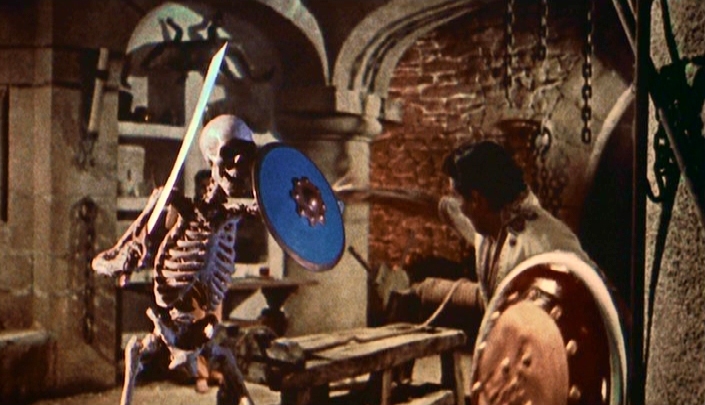 This scene was such a tour de force that Harryhausen couldn’t resist outdoing it five years later in Jason and the Argonauts, when the hero and his friends battle a cadre of no fewer than seven deadly skeletons. 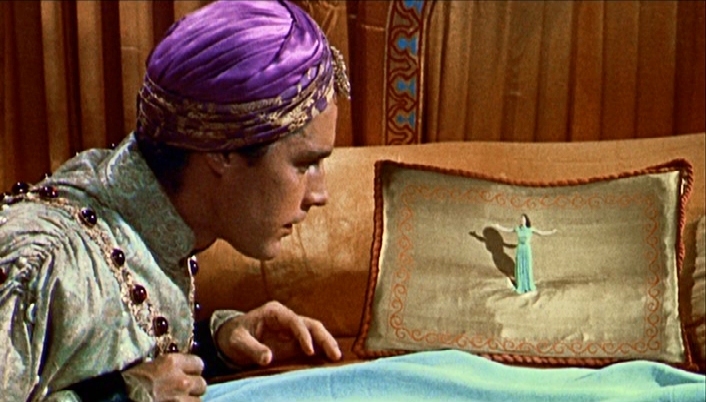 The Arabian Nights adventure came in in a blaze of glory with The Thief of Bagdad, and after years of diminishing returns it went out in a blaze of glory with The 7th Voyage of Sinbad. 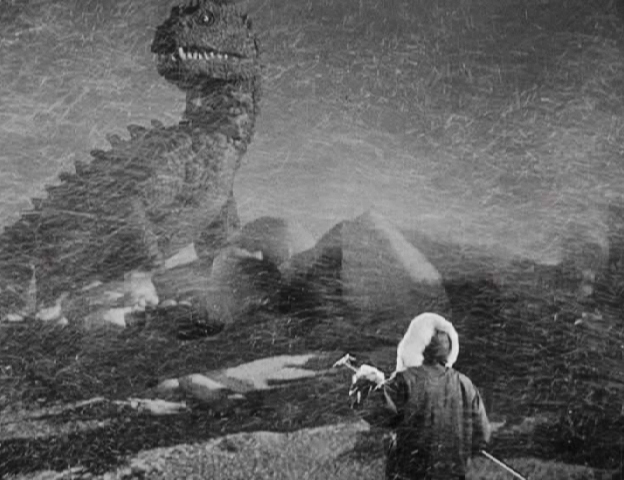 There would be other movies in the genre — Harryhausen himself would make sequels, and pretty good ones, in 1973 and ’77 — but these two movies, each in its own distinct way, are the unassailable peaks of the form, never equalled, much less surpassed. The secret to the success of both movies, of course, is that they aren’t really “Arabian” at all. What they are, in fact, is Arabesque — an elaborate fantasia on the mere idea of the tales of Scheherezade, decorated with the filigree of genies, evil wizards, fabulous monsters, dauntless heroes and pure, chaste maidens in mortal peril. heart after I saw The 7th Voyage of Sinbad. Marvelous post! I have always loved all things Harryhausen (and also read FAMOUS MONSTERS…too bad Forry gave up on his museum plans). Your pics from BEAST and SEVENTH VOYAGE were fabulous. Still, my favorite Harryhausen remains JASON AND THE ARGONAUTS. It starts a little slow, but once the voyage begins, it's incredible. Well, Erin, I'd say you've got some catching up to look forward to; you won't regret it. I hope you have access to a good home theater; the bigger you can see Harryhausen's movies, the better. There's a fairly recent Blu-ray of 7th Voyage that'll pop your eyes right out of your head; I haven't seen it looking better since 1959 — and maybe not even then. Rick, you're not alone; Harryhausen himself thinks Jason is his best, and so did Charles Schneer. I'd put it second to Sinbad only because of the element of surprise; there's no recapturing the holy-cow-jeeminy-Christmas-willya-lookit-that! impact of The 7th Voyage on it's first run. Ya just hadda be there. Apropos of Jason, when Harryhausen won his special Oscar, emcee Tom Hanks said, beaming: "Some people say Casablanca, some say Citizen Kane — I say Jason and the Argonauts is the greatest film ever made." Of course, Tom's a little younger than I am, and saw Jason at about the age I saw Sinbad. Hey, Jim, just wanted to let you know that thanks to our friend and fellow blogger Yvette, you've been chosen as one of the recipients of the Liebster Blog, in which worthy bloggers get props from their peers! Congratulations, my friend! If you know five bloggers who you think need a little love, tell them you think they're the awesome, and link back to the blog which gave you the award (in this case, Tales of the Easily Distracted :-)). Thank you, Dorian; I'm truly touched and heartened by this, especially now that I've looked into how the Liebster Blog Award works, and what it means to receive it from one of you blogo-peers. Linkback to follow on the main page, and with pleasure. Back from vacation and catching up on some blog reading. I loved your piece and think that Mr. Harryhausen is one of the cinema's greatest geniuses. Somewhat ironic that Columbia is raking in the cash via VHS and DVD sales and re-issues of titles, when back he was making the movies for them he and producer Schneer were hard pressed to squeeze another dime from them. Kinda like Columbia's treatment of the Three Stooges. I'm glad you mentioned the Tom Hanks Academy Awards tribute, but I remember being put off by his demeanor at the Oscar ceremony. Hanks seemed rather condescending in his introductory remarks at the Oscar ceremony itself (though I can't remember what he said that led me to feel this way). However, when I later saw the footage of his introduction to Ray at the actual Technical Oscars ceremony he seemed genuine and sincere in his words. But at the Oscar ceremony itself he seemed to be playing to the more sophisticated Oscar crowd. At least that's how I remember it. I could be wrong. I know he is a huge "Jason and the Argonauts" fan. "….it wouldn't be the first childhood favorite to decompose before my startled eyes, like a clumsy piece of taxidermy." Jim, what a great and vivid line!